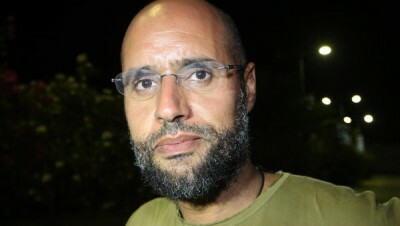 The Libyan state this week began a mass trial, the focus of which are two of deposed leader Colonel Muammar Gaddafi’s sons, his heir apparent Saif al-Islam, and Saadi, who was recently extradited from Niger where he had sought refuge from the US-led war in 2011. Also facing trial are 36 top officials, including Gaddafi’s intelligence chief and right hand man Abdullah al-Senussi, deported from Mauretania in 2012, former Prime Ministers al-Baghdadi al-Mahmudi and Bouzid Dorda, and a former foreign minister Abdul Ati al-Obeidi. They all face charges relating to their alleged role in suppressing the pro-Islamist movement in Benghazi that was utilised by NATO in order to topple Gaddafi. What is underway has all the hallmarks of another lynching, sanctioned by a kangaroo court, like that of the Iraqi leader Saddam Hussein in 2006. Eventually, a handful of international journalists, United Nations observers and family members were allowed in, after surrendering their cell phones. A court has ruled that he can be tried via a video-link to his prison in Zintan. But in the event, the Zintan militia group holding him failed to produce him for the court hearing. Seven other defendants who are being held in Misrata demanded the same right to appear by video-link. A further nine, including Saadi Gaddafi, did not appear, without any reasons being given. After an hour, the judges adjourned the case until 27 April. They ruled that defence lawyers could examine, but not take away with them, copies of the evidence against their clients. The mass trial exposes the chicanery and utter criminality of the Western powers. It stems from the charges of war crimes issued against Muammar Gaddafi, Saif al-Islam Gaddafi and Abdullah al-Senussi by the International Criminal Court (ICC) at the behest of the US, Britain and France in 2011. Such claims were entirely hypocritical and ignored the thousands of criminal air sorties by the NATO powers on Tripoli and other locations with civilian populations. It was a crude attempt to bolster the illegal regime-change campaign being waged by the American, British and French governments. After the gruesome murder of Gaddafi, and the capture of Saif al-Islam and al-Senussi by Libyan militias, it soon became clear that the western powers did not want to risk a repeat of the five-year trial of former Yugoslav ruler Slobodan Milosevic, whose self-defence exposed their bogus claims of “humanitarian intervention” in the Balkans in the 1990s. A long drawn out trial in The Hague would reveal embarrassing details about the intimate relations between the Gaddafi regime and the Western powers between 2004 and 2011, when the dictator was brought in from the cold and Libya became open for business. Al-Senussi would undoubtedly testify on Washington and London’s global torture network, while Saif al Islam might call former British Prime Minister Tony Blair and other former associates as witnesses. With the ICC indictment having served its purpose, the NATO powers and their proxies in Libya were determined not to transfer the two captives to The Hague. Instead, they sought to get around the legal obligation to hand over the two men by mounting a trial in Libya which the ICC would rubber stamp. The trial takes place under conditions of complete lawlessness, without even the semblance of a functioning political and legal system, and in which the US-installed state is on the point of disintegration and all-out civil war. Rival right-wing terrorist militias promoted by the US, the European powers and the Gulf States, have plundered the country for their own enrichment. The oil transnationals have stopped production due to the chronic instability and a number of the major international airlines have stopped flights to Tripoli, under the control of a Zintan militia, after rockets hit the runway last month. According to Nouri Abu Sahmain, the speaker of parliament, Libya faces bankruptcy due to the blockade of the oil facilities in the eastern province of Cyrenaica by militias since last July, and more recently the cutting of one of Libya’s last remaining pipelines in the west of the country. This has led the government to reach an agreement with the rebels’ leader, Ibrahim Jathran, who controls the eastern terminals, to end the blockade in return for dropping all charges against the rebels and paying their salaries. Such is the chaos that on Sunday, interim Prime Minister Abdullah al-Thinni resigned following an attack on his family by one of Libya’s militia groups. Details of the attack are sketchy but it was believed to have occurred on the road to the airport in Tripoli, where there are nightly skirmishes between rival militias. The former defence minister was only appointed a few weeks ago following the Islamist-dominated Congress’ sacking of Prime Minister Ali Zeidan. It is far from clear how Congress, which faces opposition from the oil-rich Cyrenaica province in the east and Fezzan in the south that seek autonomy within a federal state, will be able to find enough legislators to agree on a new prime minister. All but 76 have withdrawn from the 200-member Congress, which sought to extend its mandate which expired in February until the end of the year. The aim was to allow time for the 60-member Constituent Assembly to approve a new constitution to be drafted by a committee, representing each of Libya’s three provinces. But barely 500,000 of the 3.4 million electorate turned out to vote for the Constituent Assembly on February 20. While Congress has now agreed to hold parliamentary elections this summer, without waiting for the new constitution, this leaves Libya without a functioning parliament.